ARLINGTON, April 8 — Nathan is excited to expand its footprint in Zambia with its recent award of the $12mn, multi-year MarketConnect Consultancy Services. This is a new private-sector strengthening project that Nathan will implement in the country. Nathan is also currently implementing the DFID-funded Private Enterprise Programme Zambia (PEPZ). MarketConnect is a 30-month project (with the possibility of an extension for another 30 months) funded by the World Bank under the Zambia Agribusiness and Trade Programme (ZATP) and implemented via the Zambian Ministry of Commerce, Trade and Investment (MCTI). 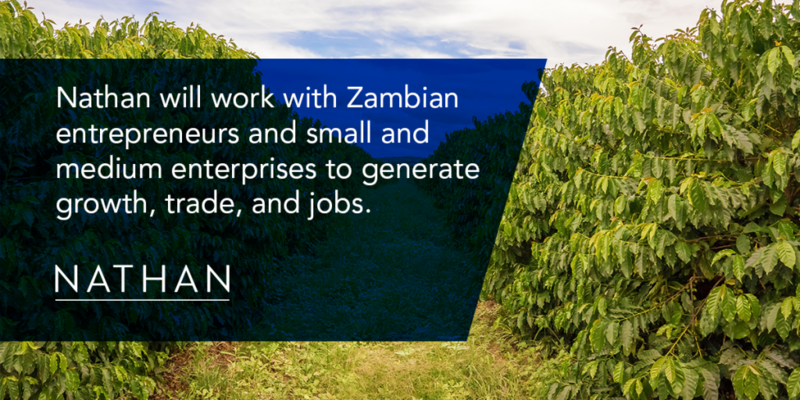 Over the next two and a half years, Nathan will work with small and medium enterprises (SMEs) in the agribusiness sector in Zambia to increase market linkages, integrate them into supply chains and contribute to firm growth. This is in line with the Government of Zambia’s goal of moving the Zambian economy from its current heavy dependence on mining, to one based on agriculture, livestock and fisheries, and their entire value chains. This brings promising investment opportunities for agribusiness SMEs and agro-processors, especially in smallholder inputs and output markets, and value addition/processing. Following a private sector driven approach that is transaction oriented and market-led, Nathan will identify SMEs as well as buyers in value chains that show a promising economic growth trajectory. The Nathan team will provide tailored technical assistance to entrepreneurs that will enable them to improve the quality and quantity of their products to ensure they are meeting buyer requirements. These include fruit and vegetables, dairy and meat and poultry. The tailored technical assistance will be focused on transactions that respond to market demand in order to yield immediate results and demonstrate high value for money to the businesses.